One case of personal supplies such as soap, diapers and cleaning wipes. One case of work supplies such as tarps, dust masks, and safety glasses. 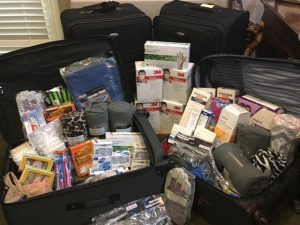 Two cases of medical supplies such as gauze, gloves and ointments. Once again it’s a team effort. 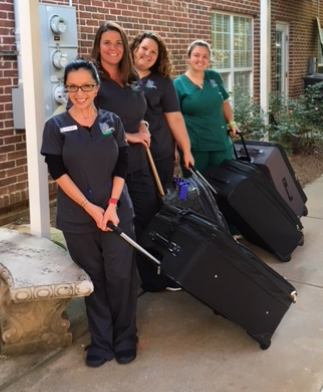 Supplies are being transpo rted by our Patient Advocate’s daughters, Mattie and Carrie. And supplies will be received and distributed by disaster workers on the ground in Mexico City who will ensure that supplies go where they are needed most. Check back for more details. We plan to send more supplies as needs on the ground develop and will welcome the participation of our KP families. 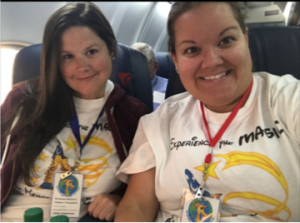 Mattie and Carrie safely delivered everything to disaster workers, who immediately transported all goods to the groups on the ground who are working directly with rescuers and victims. We’ve set up Kennesaw Pediatrics Children’s Fund to continue this work – and in the future other projects like this. If you’d like to contribute visit our KPCF page.